They say he's a hard man to please, but Prince Charles looked decidedly happy yesterday with what the builders had done in a £20m renovation of his Royal family's 'home' in Northern Ireland. Here, he celebrated his wedding anniversary and received a belated 70th birthday present to boot. And even though the DUP were at the new-look Hillsborough Castle and gardens to greet the Prince of Wales and the Duchess of Cornwall there wasn't a word, they insisted, about Brexit. It was a day instead when in a very public Hillsborough agreement, the heir to the throne - whose passion for architecture is well known - gave a regal seal of approval to the five-year project to transform the history-steeped castle and its gardens into a major tourist attraction. Charles said he and his wife of 14 years were overjoyed to be in Hillsborough to mark the official re-opening of the castle after its massive makeover. The independent charity, Historic Royal Palaces (HRP), took over the running of the castle and its 100 acres of grounds in April 2014 with the aim of re-vamping and reviving them so that curious visitors could get a glimpse of how the other half lives. Thousands of people, including cruise ship holidaymakers from all over the world, visited Hillsborough in the midst of the building programme. However, the doors will swing open fully on the spruced up castle and its new visitors' centre and restaurants later this month. A massive new car park has also been developed to make access easier to the Georgian mansion. The prince, who has stayed at Hillsborough on many occasions, became a tourist in his own back yard yesterday, getting shown around Hillsborough's new facilities. He and Camilla also met representatives from HRP, along with managers and builders, plus members of the catering and retail teams. The official formalities were completed after a small reception on the terrace of the new visitor's centre where the royal visitors, who'd been welcomed to Hillsborough by schoolchildren from the village, jointly unveiled a plaque. Charles said "good old" Hillsborough Castle had always been a special place which reflected the complex history of Ireland. He said he hoped that visitors to the castle would "come to a renewed understanding of our past and a renewed resolve for our future". He added: "As we look to the future, therefore, I hope Hillsborough Castle and gardens can now well and truly be placed on the map and can serve as both a destination and indeed an inspiration to all on the island of Ireland to enjoy." 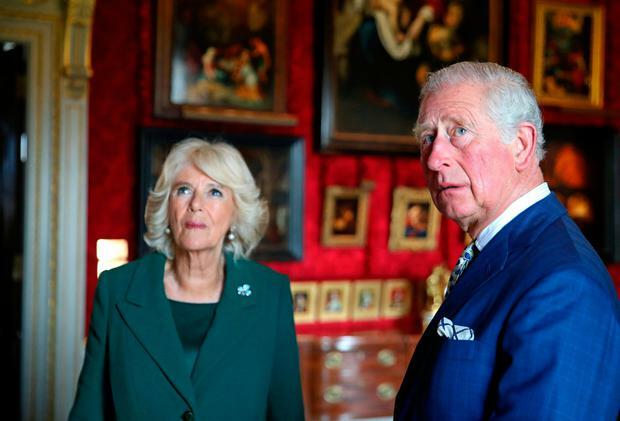 Prince Charles paid tribute to more than 700 contractors and craftspeople who were involved in the "long journey" to carry out the "extraordinary" transformation of the castle which he said many people had heard of but few had ever visited. The prince's audience laughed as he offered his thanks on behalf of himself and the duchess to people who he said had "come such a long way" to Hillsborough Castle yesterday to celebrate the couple's 14th wedding anniversary. HRP chairman Rupert Gavin said the re-opening was a major milestone in the history of Hillsborough Castle. He said the refurbishment had been a "Herculean task" in which Charles had taken a hands-on interest. "We have been very lucky as we have enjoyed the significant support, guidance, encouragement and occasionally detailed notes from his Royal Highness," he said. After the talking came the walking as the prince and duchess strolled in the sunshine - to the accompaniment of Comber Silver Band playing the Monty Python theme - through the newly-restored four-acre walled garden which was once the kitchen garden for the castle. The prince, who was sporting a blue suit, and the duchess who diplomatically balanced the colours with a green coat, met gardeners along with local volunteers and students planting vegetable seedlings in the new beds. Charles, who has admitted in the past that he speaks to his plants, was more intent on talking to the planters yesterday as he was shown around by the keeper of the walled garden, Adam Ferguson. The Ballymena man disclosed that the royal visitor had visited the fledgling garden a year ago. He said: "The prince told me he had seen a dramatic difference from 2018. He wanted to discover what we are growing and said he was very impressed. "It's good to get nice feedback. The garden is, of course, right up his street." The produce from the garden is to be used in the castle's new restaurant and stable yard tearoom which is being run by Simon Dugan's Yellow Door catering firm who are creating 35 new jobs. As the royal couple went their separate ways through the walled garden, they were offered food and drink linked to the castle. Chef Barry Smyth said the duchess had "loved" some Yellow Door bread and his staff Amanda Kennedy and Claire Nicholson added that she had been fascinated by other fruit products that the company is developing in Hillsborough. Charles also met ecologist John Wan, who is striving to protect newts at the grounds, and Mark Bryson whose EcoSeeds firm is creating a wild flower meadow at Hillsborough. The prince also took time to find out what the Ulster Wildlife Trust (UWT) has been doing in relation to red squirrel conservation. Maeve Foley, the UWT project support assistant who was accompanied on a stand by volunteer Nestor Marrero from Tenerife said: "Prince Charles told us he is very keen to know more about red squirrel conservation here and right across the UK. "He clearly has a deep interest." At one stall, Fiona and David-Boyd Armstrong were hoping that the royals might try the new bespoke edition of their award-winning Shortcross gin, made from roses, apples and pears from the Hillsborough gardens and on sale only at the castle. The duchess, who declined a taste, was overheard to say that her husband was the gin-lover in their relationship. However, he didn't get the chance to try the Shortcross because he was led away through a short cut to the next part of his visit to see a new building which is particularly close to his heart. That's because work on the castle's summer house was carried out by trainees from Charles' own foundation's traditional building skills programme under the mentorship of experts from the Historic Environment Division at Moira. The Hillsborough project was one of the '7 for 70' schemes undertaken by the Prince's Foundation to coincide with Charles' 70th birthday. And he told guests yesterday that he was delighted with his "gift". He said: "It is my hope that this programme and the wonderful building produced as a means of engendering support and enthusiasm for traditional building skills in Northern Ireland. These are vital skills which are at risk of being lost." Later at a reception in the drawing room, the prince also got his first glimpse of a new portrait of himself painted by artist Gareth Reid, commissioned by HRP to hang in the castle. The Belfast-born painter won the Sky Portrait Artist of the Year competition in 2017 from a field of 54 contenders. The prince admitted before he unveiled his portrait that he had been nervous about seeing it. But he gave Mr Reid a reassuring smile as he surveyed the painting which shows him sitting in a garden. A nod of approval came from the duchess who met more artists at the castle's new Clore Learning Centre, which the HRP say is a creative and educational space "to inspire schools and communities to discover about the history of Hillsborough" through talks, hands-on activities and workshops. Yesterday, Camilla talked with pupils from Downshire Primary School in Hillsborough who were working on paper crafts with residents from Lillie Court, a local care facility. She was introduced to artists John Kindness, who designed a new piece of artwork for the centre, and Rob Ryan, who worked with HRP to create signage for it. Mr Kindness was the artist responsible for the popular Big Fish in Donegall Quay. Lagan Valley DUP MP Sir Jeffrey Donaldson said he'd thanked the royal couple for their support for the castle renovation programme. He added that Brexit didn't come up in their conversations, joking that he had "escaped" from Westminster by digging a tunnel. As well as Hillsborough Castle, HRP is now responsible for the Tower of London, Hampton Court Palace, the Banqueting House in Whitehall, Kensington Palace and Kew Palace. Every year they welcome almost five million people from around the world to the palaces under their care and the story of the history of Hillsborough Castle stands up with the best of them. Visitors will hear how the 18th century castle which was built by Wills Hill, the second Earl of Hillsborough, has played a major role in the life and times of Northern Ireland. It was acquired by the Government in 1925 as the residence of the governor of Northern Ireland and the de facto official wresidence of the Queen and Secretaries of State. It was in the castle that then Prime Minister Margaret Thatcher and the former Taoiseach Garret FitzGeraldsigned the Anglo-Irish Agreement in 1985. The first ever meeting of the heads of state of the UK and Ireland also took place in the castle in 2005 when the Queen greeted Irish President Mary McAleese in the Red Room. The late Secretary of State Mo Mowlam has her own special mention in the official history of the castle which says she treated it as a home rather than a "stuffy" official residence. The stories of her parties have become the stuff of legend and her affection for the castle gardens was reflected in the fact that after her death in 2005 some of her ashes were scattered in the grounds.